A year spent in Prague is hardly an unusual experience these days for students, former students and all sorts of uncategorizable people in various phases of life. But the story of a South-American Indian spending a year in Prague back in 1908 presents a unique and fascinating story that seems as likely to come from a novel of the era as from real life. 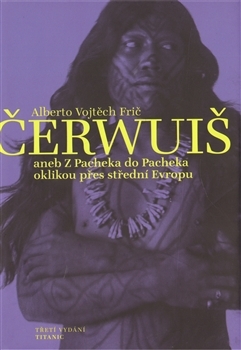 The story of Cherwuish, son of a Chamacoco tribal chieftain from the jungles of Paraguay, is the subject of this week’s Czech Literature Portal’s recommended book Čerwuiš aneb Z Pacheka do Pacheka oklikou přes střední Evropu (Cherwuish: From Pachek to Pachek Via Central Europe). Czech botanist, ethnographer and explorer Alberto Vojtěch Frič brought Cherwuish to Prague in an attempt to cure him and his tribe of an illness that was killing them off. A series of articles by Radio Prague’s Jan Velinger about the book and the experience it recounts is definitely worth reading (Part I, Part II). That the tribal chieftain entered into Prague artistic circles and even inspired a story by Frič’s friend Jaroslav Hašek – “The Indian and the Prague Police” – is just one of the interesting elements of this chapter of the fraught and complicated relationship between Europeans and South-American native peoples. Frič’s story would merit a book all to itself. In his journeys through the jungle he was compelled to kill a jaguar and a crocodile, the latter fight leading to his being nicknamed “White Crocodile” by the natives. He certainly fared better than his predecessor Italian Guido Boggiani, who made contact with the Chamococo at the end of the 19th century. He disappeared in 1901 and an expedition three years later found his buried remains with his skull bashed in, presumably to prevent him from damaging their souls by photographing them. His camera was found buried as well. The 1990 publication of Frič’s account of Cherwuish’s experiences led to contact being established between his Czech descendants and a Chamococo daughter named Hermina he likely knew nothing about. A reunion between the Czech and Paraguayan Frič family (the latter consisting of around 200 people) has resulted in an ongoing relationship and a foundation supporting the native population called Checomacoco (in Czech and Spanish, with a lot of great photos). Rights for the book can be found on its Czech publisher’s page (in English) Titanic.